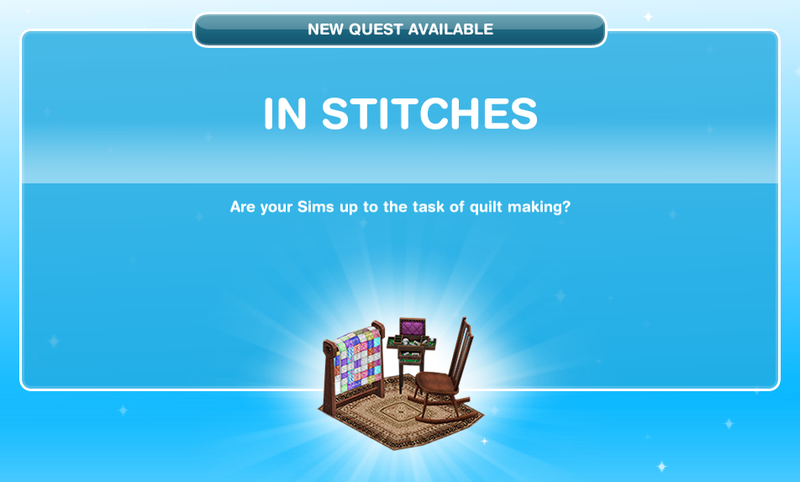 This quest unlocks the Quilting hobby and the time-limited Patchwork Teddy. Complete this set within the time limit 4 days to unlock an exclusive patchwork teddy. 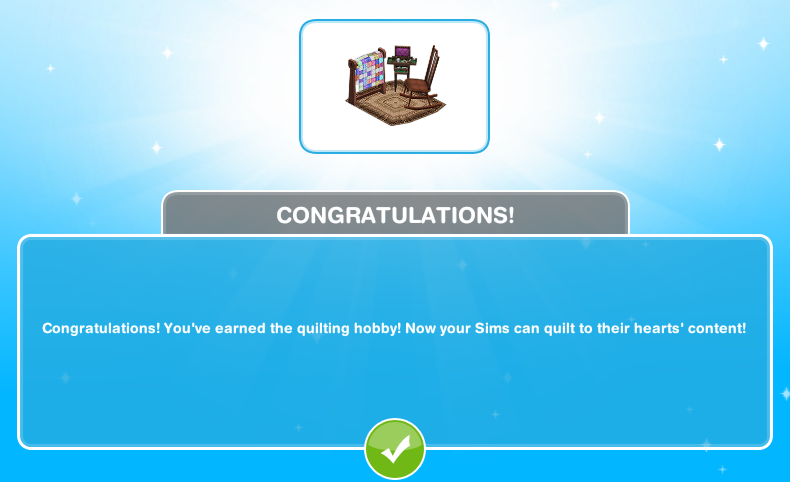 The Quilting quest: (Last verified with the Glitz and Glam update, Sept. 2015). (Life is feeling just a little tougher than usual today in Sim town. (How strange, the line got crossed and an old Sim answered the phone. She seemed so happy with life that it's hard not to feel a bit jealous of her. There's got to be a reason why! She did mention she likes the park. Why not try there? (Wow did you see the Sim sitting there on the bench? They sure looked peaceful, as if all the worries of their world were just melting away! (It's strange but making that Pizza felt strangely soothing. The patchwork look of the tasty ingredients and the warm cheesy flavour really can sooth a Sims jangled nerves from time to time. Your Sim made too much pizza though! (Seeing that Sim sitting there in the warm air feeding those ducks looked really comforting. That image is locked into your Sims mind, but only for the moment! Get your Sim to paint a picture of it before they forget all about it! (Wow did you see that incredible, colorful painting? It's enough to put a Sim into one the best moods of their Simmy little lives! (Look at that Sim freaking out like that! They looked far too excited to be looking at a bunch of colors slapped on a canvas page! A long, drawn out, peaceful game of chess is what a level headed Sim really needs. Head over to a chessboard and play a long drawn out game of chess. (That was an amazing game of chess! The pattern on the chess board really jumped out too! Kind of like, patchwork you might say. (That old Sim is one smart cookie! They said a patchwork quilt is just what your Sims are looking for! For finishing the quest in record time, you've unlocked an exclusive patchwork teddy! Find it in the Home Store! Note: Unlocking does NOT mean Free! You need to buy it for § 28,000!